"There is no limit to what can be accomplished when no one cares who gets the credit." Lewis University Cheerleaders captured a 5th place finish at the National Cheerleaders Association (NCA) College Nationals this past weekend in Daytona Beach, Florida. The Flyers finished 5th in Preliminaries on Thursday with a near flawless routine, securing their place in the Finals with a score of 7.62 out of 10 possible points. "We needed to hit a clean routine on Friday to put us into the top three", said Coach Carla Johnson. Carla accompanied the team to Florida, while Cheerleading Coordinator, Suzanne Stamm, who is on maternity leave, cheered the team on from home. None the less, the Flyers finished strong with a 5th place trophy in their division after Finals, with a score of 7.35 in Small CoEd Division 2. Congratulations!! Congrats to all the 2003 Lewis University Christmas Cheer Clinic All-Stars invited back to Lewis to perform their Cheers or Dances. Clinic All-Stars ranging from pre-school to High School performed at Women's and Men's Basketball games on January 8th, 15th and, Januray 29th, 2004. Click on the picture to left to see them in action! With over 200 participants, the girls and guys from LU lead a fun, exciting and successful Cheer Clinic Saturday, December 20th! Besides all the cheerleading fundamentals, dances and stunts taught at the clinic, participants of all ages worked with their LU cheer-buddy to learn a personalized floor cheer designed just for them! Congrats to all our Clinic Best Jumps Award Winners and Clinic All-Stars teams and individuals chosen to come back and perform on January 8th and 15th. Hope you had as much fun as we did! Can't wait till next year! Check back for the new Pictures of the All-Stars in action at Lewis! Lewis Cheerleaders help the Panthers get ready for competition! Click on the pic for full story. "The girls worked on stunting, jumps, and a new cheer. 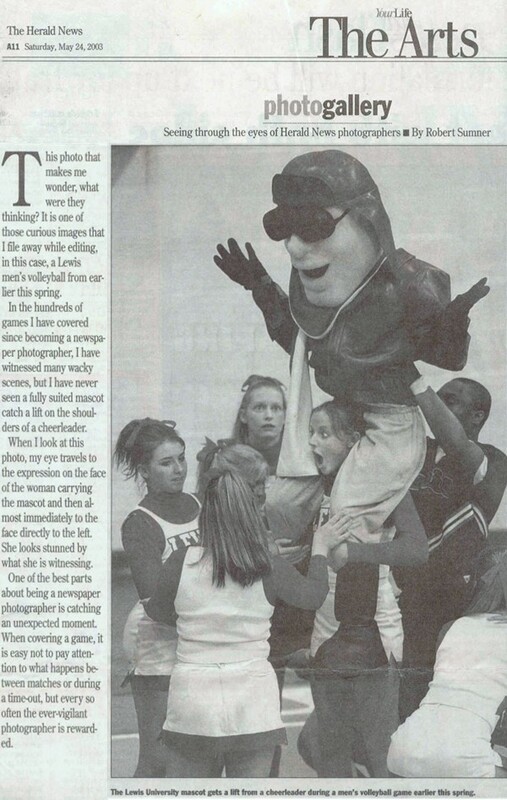 With the help of the Lewis Cheerleaders, the girls mastered stunts they had never tried before." Thanks for the 'pub' Coach Vicki! Where to begin? The Lewis Cheerleaders returned from yet another awesome NCA Collegiate Summer Camp, hosted by the University of Michigan Cheerleaders. Leading the team last week, were our newly appointed 2003-04 Captains: Natasha & Jenifer. The team came together and learned many new cheers, chants, game day pyramids, transitions and tons more! Not only did we come home with a wealth of new material, but we also brought home some awards! First of all, NCA Staff picked two All Americans from the camp! Criteria for the All American Tryouts were: a tumbling pass, including a round off back handpring full layout, a standing back tuck, a toe touch, and a extended heel stretch with a Double full down. Our Jenifer Schmidgall was one of the two! She received a certificate and the All American Medal. This award is a very prestigious award that NCA gives out. It is an all-around award. It's isn't just an awesome tumbler, it's an all around awesome, excelling cheerleading in every single area that NCA has. Staff anounced, "To be a member of NCA's Collegiate National All American Team is a very big deal and the standard is set nationwide." Congratulations, Jenifer! And to Jen's stunt group for executing the double down! Krista, Tasha, Lauren and Sarah! The next award is a very cool award because the other teams at camp vote on it, NCA doesn't pick it! It's the Most Spirited Award. As staff stated, "It is that team that's all around out of control, looking crazy, always paying attention, always going nuts in class, always cheering everybody on and Always making a very good presence. And we'd like to congratulate our Most Spirited Team, Lewis University!" The first day of camp, NCA Staff taught all teams a Fight Song dance. All teams could incorporate their own two eight counts and a stunt or pyramid sequence. On the final day of camp all teams competed by Divisions in the Fight Song Competition. Lewis University was the only Division 2 school at camp, so ended up in the Division 1 category. Lewis University defeated Minnesota State University and brought home the 2nd place trophy in the Fight Song Competition. NCA Staff put it best: "The next award goes out to a very special team. This is probably one of the coolest awards that you can win at camp. It's not who's the best, or who had the best fight song or who had the best spirit routine or anything like that. It's the Collegiate Teamwork Award and this the team that you want to be on. This is the team that loves each other, this is the team that works hard together. This is the team that encourages each other. And we as a Staff have seen this shining through and they are definitely a team like this. And we definitely want to recognize our Very Best Collegiate Teamworkers this week, Lewis University!" 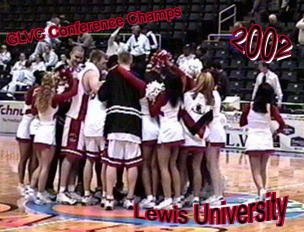 Once again, Lewis University earned a bid to compete in the 2004 NCA College Nationals held in Daytona Beach Florida. NCA staff saw something in a few team members that they thought would make great NCA staff instructors. Brandon, Ashley, Jennifer, Lauren, Jenifer and Andie were selected to tryout for NCA staff next year! Great job guys! Congratulations, Goes out to our newest additions to our family. First of all, Carla Johnson steps up as Coach. She brings years of experience and talent that will soar the team to new heights! And congrats to our new team members! Wow! The NEWS that speaks for itself! What's really going on . . . in cheer terms! Beautiful O-face on Jill with Scott on her shoulders getting ready for the Double Hitch. Zorrie's got his back, while Jen's seriously ready & set to lib it up with Ashley. J-Lo, I mean, Tasha's set on the other side:-) and then Maggie & Mandie ummmm . . . got the front!! Thanks to Br. James for sending this awesome clip to us! 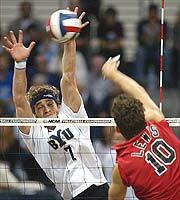 Lewis University became the first Division II team to win the NCAA men's volleyball title Saturday night, beating Brigham Young University 42-44, 30-27, 30-21, 23-30, 15-13. This is the third time in the 10-year history of the program that Lewis has reached the Final Four, losing to UCLA in the semifinals the previous two trips. Way to go Dave and guys! April 13, 2003 Academic Excellence! A huge "Congratulations!" and "Way to go!" for our teammates and friends, JILL WRIGHT, ZORRIE BROWN, RALENE SCHMIDT, NIYA MORRIS, STEFANIE LEBRE and JENIFER SCHMIDGALL. In the second year of recognitition, Lewis University Cheerleading was again included in the Delahanty Awards. 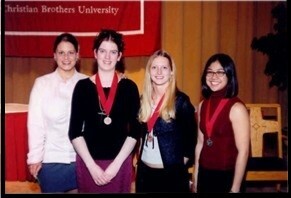 Six cheerleaders were recognized in the Student Athlete Academic Awards Ceremony on April 8, 2003. Keep up the good work ladies and gentleman! at a smaller competition last weekend. At the NCA Daytona Beach Classic, Lewis defeated Johnson & Wales University of North Miami, Florida in the Open All Star, All-Girl Division. Way to come back, Ladies! LU Cheerleaders Advanced to Finals! Click above pic for Press Release! Click on Pic for full story! Advance to Finals at National Competition. 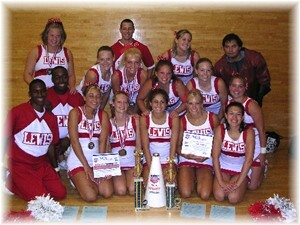 The Lewis University Cheerleaders participated in the annual NCA Collegiate National Championship in Daytona Beach, Florida, April 2-6, 2003. This championship is the worlds largest collegiate cheerleading competition and attracts more than 6000 cheerleaders, dancers, mascots and spectators. Lewis University placed eleventh in the preliminary competition out of 25 colleges competing in the All-Girl Division II competition with a score of 7.43. The following 14 institutions advanced to the final round of competition. 23- Castleton College, VT - ??? Finals, well that's another story! Have you ever dropped stuff that NEVER drops?! I mean those easy stunts that you hit all the time . . . Well, I guess the sun was in our eyes that day! We did come home with a fourteenth place trophy and a score of 7.07 - ewwwww! We sure did have fun at Finals our first year! Visit http://www.nationalspirit.com for all scores! Way to go Track Star! Jen won the Women's Long Jump and improved her standing on the NCAA provisional qualifying list for Nationals with a jump of 19 feet 1 1/4 inches at the Lewis Track Meet last Friday night. Keep up the good job and hard work! We are proud of you! with the Kindergarten & 1st & 2nd graders. With over 120 participants, the girls from LU lead a fun, exciting and successful Cheer Clinic last Saturday! Besides all the cheerleading fundamentals taught at the clinic, participants of all ages worked with their LU cheer-buddy to learn a personalized cheer designed just for them! Congrats to all our Clinic All-Stars chosen to come back and perform on January 2nd and 4th. Hope you had as much fun as we did! Can't wait till next year! The Lewis University Cheerleading Team will host a Christmas Cheer Clinic from 10 a.m.-3 p.m. on Saturday, December 21 for girls from ages 5 through high school. The cost of the clinic is $20 and includes a camp t-shirt. The clinic will consist of a jump class, a stunt class, and instruction in a variety of cheer skills. Participants will be divided into groups based on age. Cheerleaders will also be able to select their level of difficulty when choosing cheers, chants and dances. The clinic is a fundraiser for the Lewis Cheerleaders. Proceeds will assist the team in attending College Nationals in Daytona Beach in April 2003. The clinic will be held in the JFK Sports Center. Discounts are available for families enrolling more than one participant. For more information, visit http://lucheer.tripod.com or call Ext. 5933. The men's and women's basketball teams will host their annual Fan Jam Thursday, Oct. 31 in Neil Carey Arena. Festivities will include scrimmages by both teams, performaces by the Lewis University Cheerleaders in addition to a three-point shootout and slam dunk contest. Snacks, t-shirts and music will be available for all fans free of charge. Two students will also have the opportunity to make a half court shot for free tuition. Women's Scrimmage and Food to begin at 6:00pm. See you there! Ken has been a part of the LU cheerleading program from the beginning and now he brings it back home! With his cheer knowledge, expertise and commitment we are sure to have a great season! Team Objective: To promote school spirit by cheering at games and attending school events. The white team consists of male and female cheerleaders with positive attitudes and potential to perform in front of school crowds. Members of the white team may be comprised of those with abilities that are not at a level of collegiate competition and/or those who have little experience in cheerleading. The white team will primarily cheer womens basketball games and depending on squad sizes might cheer mens basketball and mens volleyball games as well. The white team may practice 2-3 times a week and have separate days and times for conditioning and weight training. Depending on the size of the team and based on the coachs decision, a captain (s) may be selected for the season. During games, the white team will perform sideline chants, time-out floor cheers and/or dances and light stunting and mounts, based on ability level. Team Objective: To promote school spirit by cheering at games and attending school events. The team will also strive to better the cheerleading program and attain recognition in the community by competing in local and regional collegiate competitions throughout the season. The red team consists of female and possibly male (depending upon competition divisions) cheerleaders with the ability to compete and practice at a collegiate competition level, such as, acquired expertise in all aspects of cheerleading. The red team will cheer at mens basketball games and mens volleyball games. During the games the team will perform sideline chants, half time and time-out routines consisting competition components in order to perfect those skills. The red team may practice up to 4-5 days a week, including conditioning and weight training. The red team will also perform advanced stunting and pyramid building, such as, 2 ½ levels high, etc. Both teams will work together in developing school spirit, promoting school involvement and actively promote safety at all times. Both teams shall fund raise together and perform at/attend school events, like Midnight Madness. Depending upon travel expense budgets, one or both teams may travel to away games. Fall tryouts will be held on Tuesday, Wednesday, and Thursday . . .
Tryouts will begin promptly at 6:30 pm and end at 8:30 pm. Report to the Student Recreation & Fitness Center front desk before 6:30 to be directed to exact tryout location. Please note: New team members will be required to work the fundraiser that weekend, Sept. 7th and 8th. Lewis University Cheerleaders earned a bid to NCA College Nationals last week at camp held at the University of Louisville. This will be Lewis Cheerleading's first appearance in a national collegiate cheerleading competition. The team pulled it together and left Louisville with what we came for! Special thanks to Becky in our time of need! And thanks to Mrs. Kern and Mr. Lebre for our transportation to the airport, you guys rock! 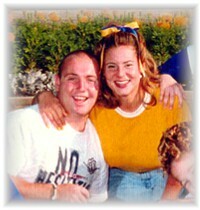 Originally written by, Gina Ingoglia, Staff Writer for the FLYER on Monday, May 6, 2002. Revised and edited by Suzanne Stamm, Coach, as to factual content. 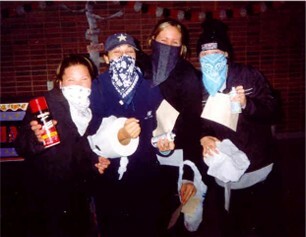 The 2001-2002 Lewis Cheerleading squad had a remarkable season. The Flyer women that are normally cheering for other teams have stepped out to earn top honors at a major cheerleading competition of their own. This season the squad had three exhibition performances and competed in a competition. This is the first time the squad competed ever. In October, the squad hosted a competition featuring forty teams that took place in the Neil Carey Arena. At the competition the girls didn't compete, but performed an exhibition that showed signs of a team on the verge. According to Kellie Ryan, former captain of the squad, the girls knew that they were going to have a great season. Their second exhibition performance took place at Fenton High School in Bensenville, III. Fenton was hosting a high school cheer competition, and the girls were excited at the opportunity to perform, even at a high school competition. The squad took a trip to Illinois State February 24 for the SuperCDA 2002 Midwest Championship. At this exhibition the girls could have taken a first place in the All-Girl College Division. They performed competitively against another all girl team, North Central College, however this was only practice for Navy Pier! This was not their greatest achievement this season.The biggest thrill of the season came March 2. The squad went to Navy Pier for the NCA Windy City Classic. At the Classic all colleges are in the same division, so Lewis's all-female squad competed against all the female squads and the co-ed squads. The girls earned the first place trophy in the Open All Star Division, naming them the Windy City Classic Champions. Another first came for the team when it was recognized at the Student Athletic Academic Awards on April 9. This was the first time in Lewis history that cheerleading was recognized as a sport. Tracy Baylon, Stefanie Lebre and Jenifer Schmidgall were recognized for their scholastic achievements as well as excellence in their sport. Over the summer, the girls will be attending a NCA cheer camp where they have a possibility to win a bid to nationals. This summer, they will again visit the ChicagoLand Speedway NASCAR and INDY races to do some fundraising. The overall feeling of the squad is positive, and they are looking forward to another great competitive season.